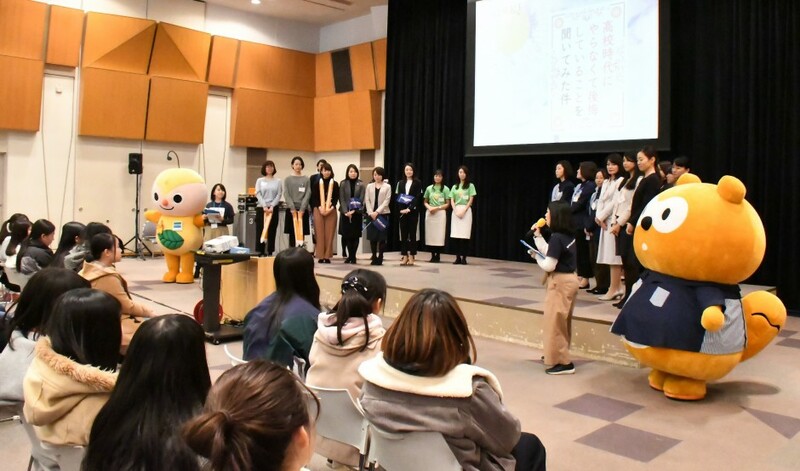 From December 15 to 16, 2018, STEP3 of the TOMODACHI High School Women Career Mentoring Program in Fukushima 2018 supported by the TOMODACHI Combini Fund was held at the National Olympic Memorial Youth Center in Tokyo. 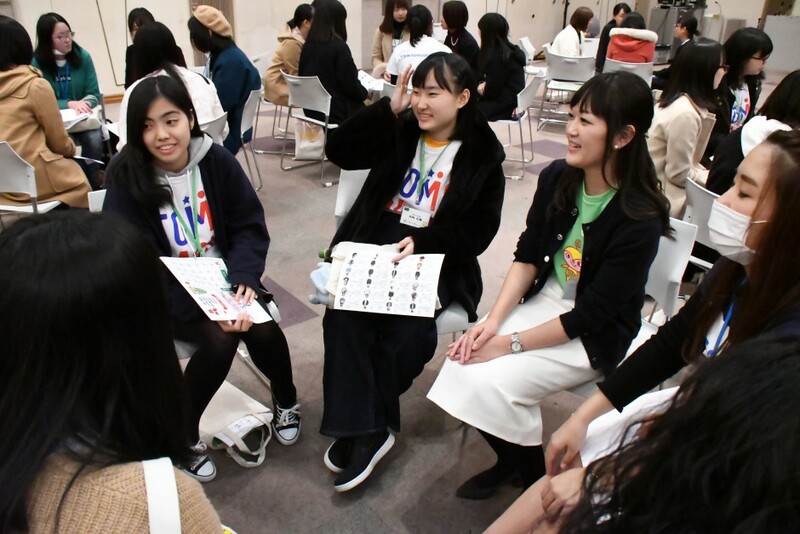 This year, the participating high school students met with 24 female employees representing eight TOMODACHI Sponsor companies (Kikkoman Corporation, All-Nippon Airways Co., Ltd., Toppan Printing Co., Ltd., Northrop Grumman Japan, Pasona Inc., FamilyMart Co., Ltd., Mizuho Bank, Ltd., and Lawson, Inc.). Before the session began, participants first presented the results from the personal challenges they set for themselves during the previous session. Students reported on their various achievements, with one student sharing that she wrote a diary in English every day and had a foreign student proofread it, while another noted that she wrote a novel. 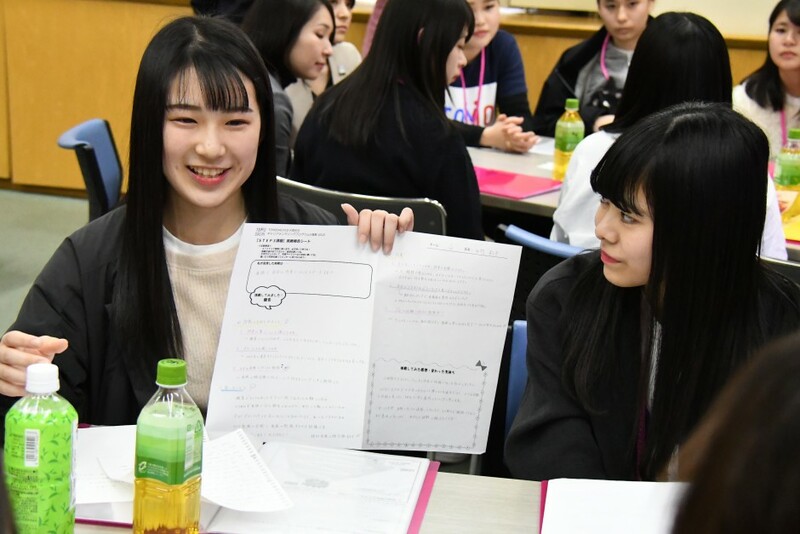 Other students shared that they challenged themselves to create presentations based on interviews with shopkeepers in a local shopping district, write a book to introduce Fukushima in English, and make it a habit to voice opinions at school club activities each day. Students applauded one another’s challenges and achievements. Afterwards, the female professionals went on stage and gave presentations based on the theme “Choices for my Future.” They each discussed ways their own companies contribute to society as a whole, as well as what they have gained from their experiences working. They also shared their life stories and delivered personal messages to the high school students. The participants who listened to the female employees’ presentations then teamed up to present about “the qualities needed to become a future shining light.” They were able to envision their own “future as role models,” which including such qualities as: when facing difficulties, we can overcome them by swallowing our pride and asking for advice; considering both ourselves and others; and, even if we are faced with difficulties, we will not limit ourselves but will take action and believe in our own success. On the second day of the program, the students prepared the presentations they will present in the STEP4 session for freshman high school students. STEP4 will be held in Iwaki City, Fukushima Prefecture from February 2 to 3, 2019. On February 3, an event entitled, “An Opportunity to Make Oneself and to Make a Future: LIVE” will be organized by the students where they will present what they learned through the program and ways they have been impacted, and deliver a message to high school freshmen.